Muggsy is the shortest player to ever play in the NBA. He was only 5' 3" tall. Muggsy is an American. He played in several NBA teams like the Washington Bullets, Charlotte Hornets, Golden State Warriors, and the Toronto Raptors. He played as a point-guard. Even with his not that tall height, Tyrone Muggsy Bogues was able to play outstandingly in the NBA. 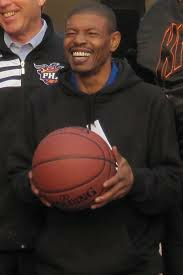 Muggsy averaged 7.6 assists per game, 7.7 points per game, and 1.54 steals per game. He was able to play great in a league that is dominated by giants. The average height in the NBA in the time when Muggsy played was 6' 7".